Wow! Nick has an incredible line-up of new programming that will be added to the network’s 2010-11 schedule, including: six new series and new seasons of 16 returning hits such as top-ranked iCarly, SpongeBob SquarePants and Team Umizoomi. Additionally, five brand-new series will bow across Nick’s digital nets, which include TeenNick, Nick Jr. and Nicktoons, during the 2010-11 season. Nickelodeon, the top-ranked basic cable network in total day for almost 16 years, is poised to close 1Q10 as its most-watched quarter ever in its 30-year history and just celebrated January as its most-watched month ever. • House of Anubis (working title) will debut in fall 2010. From Nickelodeon, in partnership with Belgium-based Studio 100, House of Anubis is a long-form mystery series and the first-ever Nickelodeon live-action show produced in Europe. Originally made for Nickelodeon in Holland, this new global version follows eight students trying to solve a hidden mystery at an English boarding school while dealing with the highs and lows of their teenage years. House of Anubis is produced in the UK by Lime Pictures. • Victorious, starring Victoria Justice (Zoey 101), co-produced by Sony Music and created and executive produced by television hit-maker Dan Schneider, follows Tori Vega (Justice) as she unexpectedly finds herself navigating life at an elite performing arts high school. Featuring an ensemble cast of teens who act, sing, dance and perform to original music, Victorious will premiere on Nickelodeon on Saturday, March 27, right after the 23rd annual Nickelodeon’s Kids Choice Awards. • Kung Fu Panda: The Series, Nickelodeon’s second collaboration with DreamWorks Animation, chronicles the further adventures of Po, the energetic, enthusiastic, always hungry martial arts panda as he protects the Valley of Peace from threats of all kind. Based on DreamWorks Animation’s hit feature film Kung Fu Panda, the Nick animated series is executive produced by Cheryl Holliday (King of the Hill, Still Standing, Father of the Pride) and produced at Nickelodeon’s Burbank, Calif. Animation Studios. • Planet Sheen, executive produced by Steve Oedekerk, Keith Alcorn (The Adventures of Jimmy Neutron, Boy Genius) and Jim Hope (George Lopez), is the intergalactic tale of Sheen Guevera Estevez–the hyperactive, attention span-challenged kid from Nickelodeon’s hit Jimmy Neutron–who crash lands on Zeenu and deals with bizarre customs and strange-looking creatures as he tries to return home. Planet Sheen is produced by O Entertainment for Nickelodeon. • T.U.F.F. Puppy, created and executive produced by Nickelodeon hit-maker Butch Hartman, follows the gung-ho, dim-witted dog named Dudley Puppy who is thrust into the role of “hero” when recruited by the super secret crime fighting organization, T.U.F.F. (Turbo Undercover Fighting Force) to protect his hometown against the evil animal organization, D.O.O.M. (Diabolical Order of Mayhem). T.U.F.F. Puppy is produced at the Nickelodeon Animation Studios in Burbank, Calif.
• Bubble Guppies is a new interactive, animated variety show for preschoolers set in a vibrant 3D, CGI-animated underwater classroom. Bubble Guppies–created by Robert Scull and Jonny Belt (The Backyardigans)–has an emergent curriculum: ideas that emerge from preschoolers’ own discoveries. Each episode will delve into a preschool topic from a variety of angles as the cast and viewers explore the swaying kelp forests, coral reefs and undersea gardens of their aquarium-inspired surroundings. • iCarly, basic cable’s top kid and tween series; True Jackson, VP; BrainSurge; and the award-winning Nick News with Linda Ellerbee. • Big Time Rush, Nick’s newest live-action, record-setting series; and The Troop, which have been picked up for second seasons. • SpongeBob SquarePants and The Penguins of Madagascar, the top two programs with kids 2-11 on television; and The Fairly OddParents. Additionally, Nick at Nite will premiere the second season of the family favorite Glenn Martin, DDS, on Father’s Day, June 20, 2010. • Team Umizoomi, the number-one preschool show on all of television since debuting Jan. 25, 2010; Go, Diego, Go! ; The Wonder Pets; and The Backyardigans. • Dora the Explorer, which is celebrating its 10th anniversary this year with four prime-time specials; an original documentary produced by Academy Award®-nominated Brett Morgen (The Kid Stays in the Picture); new online Dora content; and the “Beyond the Backpack” pro-social campaign championing overall school readiness for preschoolers. • Gigantic, coming this season to TeenNick, is the network’s second collaboration with award-winning production company Reveille. The half-hour series takes a fictional look at the glitzy, chaotic and often outrageous life of being a Hollywood “it” kid. Shot at various locations around Los Angeles, Gigantic features an ensemble cast that includes Grace Gummer and Gia Mantegna as two of the lead characters. • Voltron Panthera Force will premiere on Nicktoons this season. The series follows the exploits of a group of five young cadets brought together under trying circumstances to form a newly appointed Voltron Lion Squad dubbed the “Panthera Force.” Voltron Panthera Force is a World Events Production in conjunction with Kick Start Production. • Dragon Ball Z Kai, premiering on Nicktoons in May 2010, follows the last descendants of an evil race of warriors, known as the Saiyans, on their collision course with Earth. Goku–the strongest fighter on the planet–is all that stands between humanity and extinction and must face the villainous Saiyan warlord. Dragon Ball Z Kai is developed by Funimation Entertainment. • Teenage Mutant Ninja Turtles, debuting this season on Nicktoons, is based on four mutant turtles–trained in the art of Ninjitsu–who battle evil from the New York sewers. The animated series was recently acquired by Nickelodeon and is jointly produced by 4Kids Entertainment and Mirage Studios. Teenage Mutant Ninja Turtles is considered one of the most popular kids’ television programs and was created in 1984 by Kevin Eastman and Peter Laird as a successful comic book series. • Dino Dan will premiere fall 2010 on Nick Jr. The new original series combines live-action with CGI-animation to create an adventure-filled modern day world where dinosaurs roam freely. Developed and produced by Sinking Ship Entertainment and directed by J.J. Johnson, Dino Dan will deal with relatable kids’ issues and teach preschoolers scientific information from new species to dinosaur vocabulary. Dino Dan was co-developed by real life palaeontologist-in-training, 11-year-old Daniel Cook. 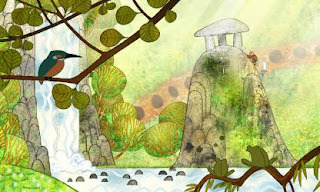 A surprise Oscar nominee, “The Secret of Kells” is a 2-D, hand-drawn throwback amid its computer-generated, stop-motion and 3-D competitors, demonstrating the encouraging range of animation styles utilized in contemporary feature filmmaking. Although it’s unlikely that this gem from the producers of “The Triplets of Belleville” will overthrow the ultra high-tech “Up” on Oscar Sunday, that it’s even in the mix shows that story and artistry, no matter what tools are used, are the things. At the heart of this story is Brendan (Evan McQuire), an orphaned boy living with his uncle Cellach (Brendan Gleeson), the abbot at the isolated and fortified Abbey of Kells. Drawn in rich reds with long, bold lines, Abbot Cellach is a strict and fearful man who has forbidden his nephew (soft browns and delicate strokes) from going beyond the confines of the wall he’s having built around the outpost to protect it from Viking marauders. One day Brother Aidan (Mick Lally) arrives, an unfinished manuscript under his arm, and invites Brendan to help him complete it. (Like his apprentice, Aidan is illustrated in soft grays and fragile lines.) To do so, though, Brendan must fetch berries from the woods to make emerald ink, and he ventures into the outside world for the first time. There he meets Aisling (Christen Mooney) — ghostly and wolf-like — a girl who makes her home in the forest filled with mythical creatures. Against his uncle’s wishes, Brendan befriends Aisling and works with Aidan on the manuscript, and when the barbarians arrive, it becomes clear as to whether Cellach’s wall or Brendan’s book of hope and knowledge is the better fortification against the coming darkness. 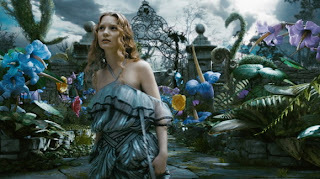 Earlier this week, I had the opportunity to screen the new Tim Burton / Disney version of Alice which opens today. It entirely off the wall, as one might expect, but not nearly as dark as I thought it would be. This is a film that will absolutely be enjoyed by filmophiles, particularly Burton fans. But, you might want to take your child’s temperament into consideration before hauling them over to your local Cineplex. The visual element of this film is stunning. Burton’s characters are awesome, he takes off in an entirely new direction with our favorites. Mad Hatter, played by Johnny Depp is as charming as ever. Mia Wasikowska deftly plays an older Alice who is returning for a 2nd visit to Underland. She is beautiful, pale skinned and brave in a cautious kind of way. How she manages to deal with all the size changes she undergoes is another question altogether. I particularly loved the evil Red Queen played by Helena Bonham Carter whose chilly demeanor would stop most of us in our tracks. Her oversized head leaves room for comment but it is her mouth, with its pursed lips and heart shaped lipstick that is reallyl cool. And then, there’s the way she solves every disappointment by shouting, “Off with their head!” My my. Anne Hathaway’s White Queen isn’t quite as charming as I would have liked but the Caterpillar, Cheshire Cat and White Rabbit were right on par. Tweedledee and Tweedledum as as cute as twin Pillsbury Doughboys and goofy in the same way they speak in rhyme and finish one another’s sentences. Of course, Depp steals the day with his Mad Hatter portrayal. He somehow makes us delight in the zany antics of the MH including the famous Tea Party which borders on absolute lunacy. The storyline blends two of Lewis Carrol’s books, Alice’s Adventures in Wonderland and Through the Looking Glass, both of which captured my imagination when I was young, and rediscovered again as a young adult when we went back to examine the strangeness of the hookah smoking caterpillar and the size-changing mysteries of Alice. When Alice is faced with a surprise engagement announcement to the perfectly boring Lord Hamish Ascot, it seems only natural for those of us from a non-Victorian culture that instead, she dashes, follows a waist-coated rabbit and drops down the rabbit hole to revisit “Underland.” She has been there before but only remembers it in her dreams. Upon arriving, everyone greets her cordially, as a returning guest and point out to her the premonition that Alice will save Wonderland by slaying the Jaberwocky. There is only one question, no one is certain that she is the right “Alice.” Alice claims this is her dream and she can make of it as she wishes. This film shows off Burton’s mastery as a visual artist. It’s a treat to look at. You surely won’t be disappointed in that. As to the 3D aspect, it adds little to the production and apparently was added in post production. So, don’t stress if you can’t see it in 3D, it seems that 2D will be as appealing, and perhaps even more so. The storyline is perhaps a bit weak. The final act, after Alice succeeds in slaying the Jaberwocky, is a quick spirited feminist recap Alice tells off the hosts and guests at her engagement party – and struts off to pursue a life of her own making. I’m a huge Tim Burton fan, just saw the retrospective exhibit at MOMA in New York which includes drawings he made as a teenager. Tim has always exhibited an interest in the bizarre and oftentimes, the dark side of things. This new Alice has drawn mixed reviews from the critics. 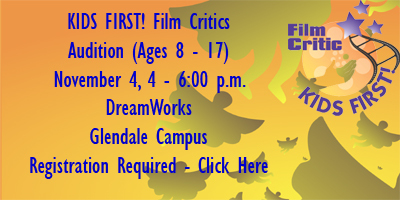 Unless you don’t like creativity, disregard all those panning this film, and check it out for yourself. It’s not as twisted as I thought it would be but I definitely would not take a child under the age of 6. I’m plan to see it again and will take my two grandsons, ages 8 and 14. I have heard great things about the videogames based on the show. Last, here’s a fun thing: The Lobby Lounge at Mandarin Oriental, New York is serving a delectable Mad Hatter Tea from 2:30 pm – 4:30 pm daily beginning March 1 until April 30, 2010. Tish Rabe has created an inspiring Bunny character and animal friends who will delight both children and adults alike. 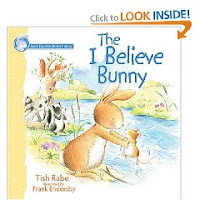 Anyone who trusts in a higher power, and in their own power, will enjoy sharing both “The I Believe Bunny” and the second book in the series “Sharing with You,” to their children, grandchildren and friends. Each book teaches important lessons about using the power of prayer and trusting in God to carry us through. With a little faith in ourselves and a little help from our friends, anything is possible. Bunny’s playful forest animal friends Mouse, Squirrel, Skunk and Raccoon share in the adventures and in the important lessons to be learned. In the first book, a little mouse gets caught in the river on a rainy day. Bunny valiantly tries to save her, and realizes she can not do it alone. She calls on God’s help to be strong, and no sooner said than done, the animal friends come to the rescue. The mouse is so thankful, the sun begins to shine, and we learn the power of having faith in God’s love. In “Sharing with You,” the I Believe Bunny, Little Mouse and friends appear in a different type of encounter. Bunny invites Little Mouse to play at her house, and in gratitude, after playing, Mouse shares a favorite flower. All the friends then come over to have a joyous time. When Little Mouse wants to play with Bunny’s favorite shiny rocks, Bunny has a hard time sharing her favorite things. While she is deciding what to do, Maggie the Magpie flies down and takes one of the rocks away into the sky. Squirrel intervenes, knowing that Maggie likes bright, shiny things. She parts with her own bright ring claiming a friend means more than any “thing” does. As Maggie parts with the rock, it falls to the ground. At that moment, Bunny realizes what to do. She “knows” sharing is the right thing to do. The charming playful quality of the rhyming text combined with the beautiful illustrated watercolor characters bring us life inspiring messages to make a difference no matter how big or small we are, and that sharing can make life more fun! The accompanying web site www.ibelievebunny.com, has a variety of wonderful resources to complement the storybooks. Sing along with the songs “I Believe in You” and “Time to Snuggle Down” along with the “Get Ready to Share” music video with Tish and her two children, and the music video with two young children, “The I Believe Bunny Song.” Download the “Count Along With the I Believe Bunny” worksheet along with a coloring page with the inspiring message from the first book “You CAN make a difference, even a bunny …your size,” to reinforce the story’s messages. Enjoy the digital storybook online for an additional reading experience with your child. According to a new study from Bettina Cornwell at the University of Michigan, “Three to five year olds understand brands .” Preschoolers have the ability to judge products based on popularity and relevance in their lives. The study underscores the importance to monitor advertising to children. Marketers, and the companies they represent, are continually trying to figure out how they will cultivate the brand faithful. Even the youngest consumers, including preschoolers are receivers of these messages—but do they understand them? A recent study co-authored by researchers at the University of Wisconsin and University of Michigan reveals young children experience some of the same marketing pressures as young adults and truly do understand the power of branding and advertising. Knowing when children become vulnerable to advertising helps regulators protect children from marketing pressures, and research shows that children may be influenced by advertising earlier than previously thought. U-M Kinesiology Sport Marketing Professor and co-author of the study, Bettina Cornwell, confirmed that children can possess an emerging knowledge of brands as early as age three. In the two-part study, published in Psychology & Marketing, the researchers first assessed brand recognition levels in 38 children aged three to five years old. Mainstream brand logos, like Lego and Coca-Cola, were presented to children on a card. In individual sessions, brand names were shown to the children with questions like, “Have you seen this before?” and “What types of things do they make?” The children’s recognition rates were as high as 92 percent for some of the 50 brands tested across 16 product categories. The most commonly recognized brand was McDonald’s, followed closely by other brands of fast food, soda and toys. This showed clearly that children as young as three can readily recognize the brands marketed to them. The second part of the study tested another 42 children between the ages of three and five. Each child was tasked to place smaller cards with pictures on them on a collage that started with only the parent brand logo. For example, a researcher presented a McDonald’s board and Burger King board and asked the child to place all the smaller picture cards that belonged with McDonald’s (e.g. ; French fry box, “drive thru” sign, and Hamburglar figure) on the McDonald’s board and all the Burger King ones on the Burger King board. After scoring was completed, this test found children were more likely to have a developed brand knowledge for brands primarily targeted to them, possibly because they see brand logos each time they open a packaged item or have a vested interest in being able to request the item by name to a parent or caregiver. Moreover, an additional aspect of the study measured the child’s understanding of brand meaning. Young children know that brands communicate. Having particular toys or getting to go to particular restaurants tells something about the brand user even for the very young. Cornwell said, “Before this study, research suggested that brand symbolism does not develop until age seven or eight. The results in both segments of the study clearly show this can happen much earlier than grade school but it depends on the individual child’s development. We believe when messages are tailored to captivate a child’s attention, information may be more easily processed and stored, therefore increasing a child’s brand understanding. The results of this study could not be timelier, given the recent “Let’s Move” nationwide campaign announcement by First Lady Michelle Obama. The “Let’s Move” campaign aims to support nutritional meals in schools with an additional focus on increasing physical activity. “It’s a fact that one in three kids is overweight or obese in the U.S. and society is spending $150 billion per year treating obesity-related illnesses. I think the outcomes of our study help paint the picture that young children really do understand the power of branding and advertising and highlights the need for lawmakers to continue to monitor and regulate advertising to children” said Cornwell.